“Circus of Hypocrisy”: Jeremy Scahill on How World Leaders at Paris March Oppose Press Freedom | Democracy Now! AMY GOODMAN: An estimated 3.7 million people rallied across France Sunday in response to the Charlie Hebdo shootings and ensuing attacks that left 17 people dead. On Sunday, more than 40 world leaders traveled to Paris for the demonstration. At the Place de la République, demonstrators wearing Charlie Hebdo headbands waved French flags, and some sang “La Marseillaise,” the national anthem. Several mounted the Statue of the Republic, a symbol of the French Revolution, and hoisted up an inflated pencil to honor the killed Charlie Hebdo cartoonists. Here are some of the voices from the streets of France on Sunday. DEMONSTRATOR 3: [translated] I sympathize with the people who have lost their loved ones. I would like to tell French people not to get confused, that at no time, in not a single book related to religion, whether it be the Qur’an, the Bible or the Torah, is it asked to kill one’s fellow man or woman. DEMONSTRATOR 4: [translated] Everybody is concerned, not only in France. It’s all the people. The entire planet Earth is concerned. That means we’re united. All countries are free, but we are here to prove that France is a welcoming country and that we are really free to express our joy whenever we want. AMY GOODMAN: Voices from Sunday’s demonstration in France, one of the largest protests in the nation’s history. Again, 3.7 million people marched across France. The march took place two days after the gunmen who attacked Charlie Hebdo, Chérif and Said Kouachi, were killed by police after a siege at a printing works plant following a three-day manhunt. Minutes after the print shop assault, police broke a second siege at a kosher supermarket in eastern Paris. Four hostages died there along with the gunman, Amedy Coulibaly. France has announced it will deploy 10,000 soldiers on home soil and post almost 5,000 extra police officers to protect Jewish sites. On Friday, Chérif Kouachi said he received financing by the Islamic cleric Anwar al-Awlaki in Yemen. He made the assertion to BFMTV before his death. CHÉRIF KOUACHI: [translated] I’ll tell you only that we were defenders of the Prophet Muhammad and that I was sent, me, Chérif Kouachi, by al-Qaeda of Yemen. I went over there, and it was Anwar al-Awlaki who financed me. Rest in peace. AMY GOODMAN: Reuters is reporting both brothers who carried out the attack against Charlie Hebdo traveled to Yemen in 2011 and had weapons training in the deserts of Marib, an al-Qaeda stronghold. Meanwhile, a source within al-Qaeda in the Arabian Peninsula has provided The Intercept with a full statement claiming responsibility for the Charlie Hebdo attack. The statement reads in part, quote, “The leadership of #AQAP directed the operation, and they have chosen their target carefully as a revenge for the honor of Prophet …The target was in France in particular because of its obvious role in the war on Islam and oppressed nations,” unquote. Al-Qaeda in the Arabian Peninsula members have taken to social media and discussion boards to praise the attacks. 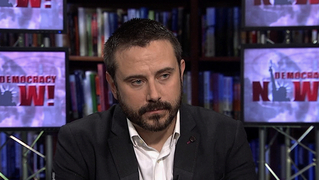 Well, for more, we’re joined by the article’s author, Jeremy Scahill. He is co-founder of the TheIntercept.org, where his new article is “Al Qaeda Source: Al Qaeda in the Arabian Peninsula Directed Paris Attack.” His latest book, Dirty Wars: The World is a Battlefield, it’s now out in paperback. His film Dirty Wars was nominated for an Academy Award. He’s also author of the best-selling book Blackwater: The Rise of the World’s Most Powerful Mercenary Army. AMY GOODMAN: Let’s talk about this latest news out of France. JEREMY SCAHILL: Yeah, well, I mean, first of all, you know, what we saw yesterday on display, on the one hand, was very heartening, to see so many people come into the streets. And, you know, one of the core issues of press freedom, if this is a moment where the whole world is saying we have to have a free press, and that no matter how controversial or hateful some of the speech is or may be interpreted in some communities, that we judge a free press by how we treat the journalists or the stories that we don’t like or that we’re offended by. But on the other hand, this is sort of a circus of hypocrisy when it comes to all of those world leaders who were marching at the front of it. I mean, every single one of those heads of state or representatives of governments there have waged their own wars against journalists. You know, David Cameron ordered The Guardian to smash with a hammer the hard drives that stored the files of NSA whistleblower Edward Snowden. Blasphemy is considered a crime in Ireland. You had multiple African and Arab leaders whose own countries right now have scores of journalists in prison. Benjamin Netanyahu’s government in Israel has targeted for killing numerous journalists who have reported on the Palestinian side, have kidnapped, abducted, jailed journalists. You know, there’s this controversy right now: Why didn’t President Obama go, or why didn’t Joe Biden go? You know, Eric Holder was there already and was representing the United States. I think that we should remember—and I was saying this on Twitter over the weekend—that Yemen should have sent the Yemeni journalist Abdulelah Haider Shaye as their representative. He, of course, was in prison for years on the direct orders of President Obama for having reported on secret U.S. strikes in Yemen that killed scores of civilians. Or Sudan should have sent Sami al-Hajj, the Al Jazeera cameraman who was held for six years without charge in Guantánamo and repeatedly interrogated by U.S. operatives who were intent on proving that Al Jazeera had some sort of a link to al-Qaeda. So, you know, while there is much to take heart in, in terms of this huge outpouring of support for freedom of the press, hypocrisy was on full display in the streets of Paris when it came to the world leaders. AMY GOODMAN: Reporters Without Borders issued a statement saying it, quote, “condemns [the] presence of 'predators' in [the] Paris march,” and, quote, “is appalled by the presence of leaders from countries where journalists and bloggers are systematically persecuted such as Egypt … Russia … Turkey … and United Arab Emirates.” A Gabonese journalist covering the march expressed similar reservations about his president, Ali Bongo Ondimba, participating in the event. GABONESE JOURNALIST: [translated] He banned demonstrations in his own country and is coming to a demonstration in France. That’s intolerable for us. It’s a complete hypocrisy. We’re here not only to show our outrage for what happened to Charlie Hebdo, but also to show our outrage over the fact that dictators like Ali Bongo Ondimba are present here in Paris, in a country that supports human rights, at an assembly that is in fact dedicated to freedom of expression, freedom of the press. AMY GOODMAN: That, a Gabonese journalist covering the march, expressing reservations about his president participating in the march, Jeremy. JEREMY SCAHILL: Well, and then you have—you know, you have General Sisi, the dictator of Egypt, who apparently is showing his solidarity for press freedom by continuing to preside over the imprisonment of multiple Al Jazeera journalists whose only crime was doing actual journalism and scores of other Egyptian journalists that never get mentioned in the news media. Another thing that I think is really absent from a lot of the coverage of the aftermath of this horrific massacre is that France also is a surveillance state. And France has a very Islamophobic position toward their immigrant community, but also toward second- and third-generation Arabs or people from other Muslim countries who have settled inside of France. And there’s going to be an intense—intensification of an already overreaching surveillance system inside of France. You know, some months ago I was on the show talking about the U.S. watchlisting system, and one of the things that we heard when we were doing this report on how you end up on the no-fly list or on the watchlist was that people within the U.S. counterterrorism community, who are actually trying to prevent acts of terrorism from happening, say that they’re flooded in information and that if everyone is on the watchlist, effectively no one is on the watchlist when it comes to actually looking at who might be engaged in these kinds of terror plots. And let’s remember, while horrifying and reprehensible, these incidents represent a relatively minor threat to Western society. You know, in terms of the actual threats facing our society, this doesn’t even rank in the top five. And so, you know, to have this kind of a reaction is not only a waste of a tremendous amount of money, but it is going to encourage, I think, future acts of terrorism. AMY GOODMAN: And, of course, it is a horrific moment where people actually see it before them. JEREMY SCAHILL: Yes, right. But, you know, it’s, again, the—let’s remember that the United States bombed Al Jazeera in Afghanistan very early on after 9/11, then bombed the Sheraton Hotel in Basra, Iraq, where Al Jazeera journalists were the only journalists. Then they killed one of the most famous Al Jazeera correspondents in Baghdad in April of 2003, when Victoria Clarke, George Bush’s Pentagon spokesperson at the time, basically said if you’re an unembedded journalist, you’re with the terrorists, and if you die, it’s not our fault. They shelled the Palestine Hotel, killing a Reuters cameraman and the Spanish cameraman José Couso. So, yes, we should be condemning any and all attacks, especially when they’re killing journalists, no matter who the perpetrators are, but let’s not act as though the West’s hands are clean and that any one of those world leaders marching yesterday, that their hands are clean on these matters. AMY GOODMAN: We’re talking to Jeremy Scahill, founder of The Intercept. When we come back, we’re going to talk about the article that he’s written, “Al Qaeda Source: Al Qaeda in the Arabian Peninsula Directed Paris Attack.” His latest book, Dirty Wars: The World is a Battlefield. This is This is Democracy Now! We’ll be back in a minute.